There were only 77 finishers of the 2008 Tour of California, only 58% of the 132 riders who finished the Prologue. The rider who endured the longest time in the virus-ridden peloton was Michael Creed of Rock Racing, 30:16 back from the leader. The 27-year-old American in his acid green livery is shown here taking the inside line on Il Grillo around a curve. "Michael was one of the first riders in the peloton to come down with the sickness that blitzed through the peloton and race staff. He was awake nearly the entire night Sunday and very nearly didn't start the race Monday. . . . Attacking from the start of the [final] 93-mile (150 km) stage, Creed played an instrumental role in a pair of breakaways that stayed clear of the peloton on a rain-soaked, bone-chilling ride from Santa Clarita to Pasadena. Aggressive to the end, Rock Racing nearly scored its second podium finish of the race when Creed attacked inside the final mile and finished fourth in a five-up sprint in front of the Rose Bowl." Did you notice Bettini's leg muscles in the photo? If I were a pro going up against him, those would hurt my eyes to look at. 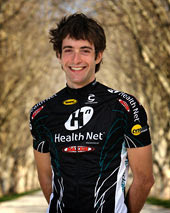 The current Lanterne Rouge is Roman Kilun, an American rider for the Healthnet Pro Cycling Team presented by Maxxis. He lives in Oakland, California and stands a (relatively) towering 6'3" (that's 9 inches taller than Il Grillo). Go Roman! His time is now 49:12 behind the leader, but the placings should be shaken up again today in the Solvang time trial. He didn't ride first today, apparently because they're arranged by teams, but the poor guy had the bad luck to flat on the Solvang time trial course and came in with a time of 39:14, so he may keep his Lanterne Rouge position at least another day. Update: He had been battling the virus that has been sweeping through the peloton, and unfortunately his finish time was outside the limits, so he was eliminated in Stage 5. Here's Dave Zabriskie riding today in his National Champion Time Trial jersey on his Felt bike for Slipstream-Chipotle in the opening prologue in Palo Alto.